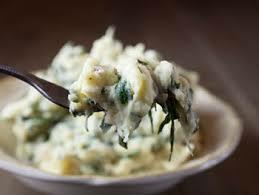 For maximum nutritional benefits try this recipe for adding greens to your mashed potatoes. It uses no oils or butters but still has a fantastic flavor. Put potatoes in pan and cover with stock or water. Bring to a boil and turn down to simmer for 40 minutes or until potatoes are soft. Place chard on top of potatoes and simmer for 15 more minutes. Remove any remaining liquid and add 6-8 oz. of non-fat or coconut yogurt. Mash together. Add more yogurt or soup stock if the mixture is too dry. Variations: The same recipe can be used with kale or collard greens. When using these greens, remove the central stems by stripping the leaves before shredding them. Chris’ Note: After the potatoes are drained but before they are returned to the pot, use some stock or a tiny bit of oil or butter to sauté a minced clove or two of garlic then blend in with the potatoes and greens.